But now's not the time to worry about that. Now's the time to celebrate a marvelous game of cricket and a rather unexpected series whitewash against Pakistan in the UAE. We're signing off now and there'll be no more cricket live text until Boxing Day, when England open their Test series in South Africa. For those wondering, the World T20 is being held in India from 11 March until 3 April. Rather bizarrely, the schedule has not been announced yet. More from England captain Eoin Morgan: "We looked back at the one-day game here when you saw how quickly the ball changed as it started turning square. "I don't think we answered those questions with the bat as it was only a par score on the board but Vince and Woakes proved their worth to the team. "You haven't seen us at our full potential yet but hopefully you will do soon." England captain Eoin Morgan: "The rational behind our rotation is long-term development with the T20 World Cup round the corner. "We don't have the privilege of a very good domestic tournament so don't see these guys under much pressure - they only get it with some derby games and on Finals Day. "We've been playing in similar conditions to what the World Cup will be like in India, facing a lot of spin so it's great to win this series. "I don't know what my best XI is but it's not a concern, with the rotation throughout this series we can go through a stage of picking the guys in form from 15-17 names. "That breeds a good culture and the guys are really buying into it. England captain Eoin Morgan, speaking to Sky Sports: "Handing Chris Jordan the ball in that super over epitomised the quality of our squad. "We've watched him a lot in the nets and he's our best yorker bowler so once we decided on that plan it was an easy decision to go to him. "Chris Woakes has a different set of skills but once we chose to go for six yorkers, it had to be Jords." England captain Eoin Morgan: It's really topped off a fantastic tour. I don't think we deserved to win but we showed fight to take it to a super over and Chris Jordan really stepped up under pressure with six yorkers." Pakistan captain Shahid Afridi: "Credit to England, they did well. We played well and batted well but missed an opportunity again. In the last five overs we didn't bowl well. Shoaib Malik set an example to the others with the bat and others should learn from him. England are a world-class team. There are lots of positive things to come out of the series. There are problems too, which we have to sort out." England batsman James Vince: "It's pleasing to contribute to the wins in my first series. Some of the situations I had to dig in a bit but it's good to be in a winning side." England's James Vince picks up the man of the series award in his debut series. Andy: Can Chris Jordan change to football and do Penalty Shootouts for England please. The presentation is under way, with Chris Woakes and Chris Jordan picking up an award each. Pakistan's Shoaib Malik is named man of the match. Malik says: "I would have been happy to win the game but this is T20 cricket. I have to congratulate the England team for the way they have played." So, England will end 2015 unbeaten in the shortest format. A phenomenal effort considering they've played Australia, New Zealand and now Pakistan in sub-Continental conditions. Batmaker_bates: That was thrilling just watching the text updates on my phone. "There are a lot of cricketers here for England, maybe even 20 or so in contention. It's tough to whittle that down even to a World Cup squad, let alone a starting XI." Can England go to the World T20 and win the thing? In India? It's coming together quite nicely... there's plenty of power in the batting, they have two reasonably experienced spinners and their quicks appear to be picking up the skills needed against the big hitters of the world game. "I don't think England are far behind the leading nations in T20 cricket. Leading up to the T20 World Cup the only challenge for England is who is there best XI? You've got Ben Stokes, Steven Finn and Mark Wood all to come back in." That was a very useful exercise for England ahead of next year's World T20. Now they know who to chuck the ball to if they are in this situation again. That, by the way, was the sixth Super Over in T20 international cricket. The lowest previous score was Australia's 6-1 against Pakistan in 2012. Sachin Mainkar: My guess is players don't understand Super Over, b/c they don't play enough of them. How can there be dot balls ? "You can see how much this win means to England from the way they're celebrating. To come away with a T20 whitewash having rotated the squad shows there is a real depth of talent and skill in this squad." "A direct hit and he would've been struggling but he sprinted that second one hard and the celebrations begin in the England dressing room." 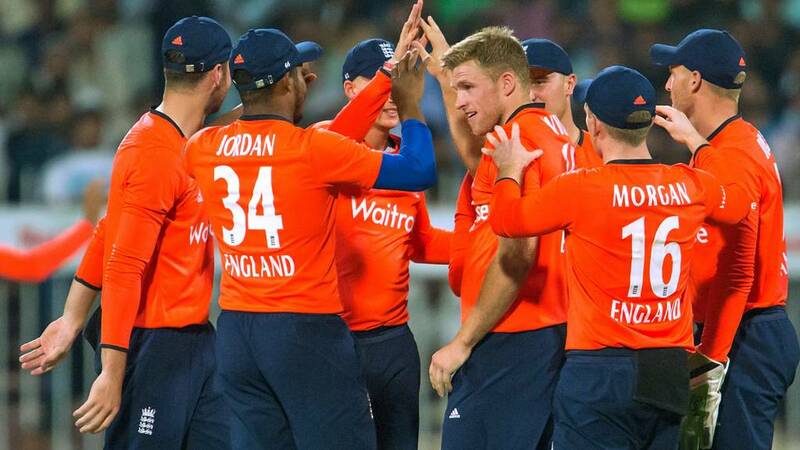 Eoin Morgan pulls Jos Buttler through for a nervy two and England have won. Of course, I questioned the Super Over in jest. That was superb drama - and a credit to both sides. And take a bow, Chris Jordan. "It's been more of a nudge-off than a Super Over." Super Over? I want my money back. A single for Jos Buttler. Eoin Morgan pushes a single to mid-off. Over to you, Jos B.
Eoin Morgan hits fresh air. Dot ball. Don't panic. Yet. "This can be done in one ball and I think that's what England will be hoping for - for these two to clean things up." So, Shahid Afridi has opened the batting and bowling in this Super Over. And he's captain. It's like schools cricket in that respect. Hang on... it looks like Sohail Tanvir has been thrown the ball by Pakistan. Nope, it's Shahid Afridi. What a carry on. Jos Buttler and Eoin Morgan march to the crease for England. Shahid Afridi will take the ball for Pakistan. Will England look to get the four needed off the first ball? Or just play it safe and look for the singles? "The crowd are going, they're streaming out down the stairs. They don't think it's enough and I think they're right." "This is all about pressure, being able to hold your emotions and your never in this moment." That's the cricketing equivalent of sending Tony Adams, Steve Bould, Lee Dixon, Nigel Winterburn and David Seaman to take your penalties. But the gamble worked for England. Excellent stuff from Chris Jordan. We all doubted him, and now we all look foolish. "Leg stump is out of the ground and that is the final delivery. Pakistan have mustered a grand total of three from their Super Over. The next lowest is six." We take it all back. Chris Jordan has bowled a sensational Super Over there. Umar Akmal is bowled when he shuffles across his stumps and has his leg peg removed from the ground. Dot ball. Is this the greatest over in Super Over history? A 90mph heat-seeking yorker crashes into the batsman's pads. Leg-bye. A leg-bye. A great start from Chris Jordan. Anwar Ali, by the way, is padded up to come in next. Is that just because he already had his pads on? Great decision! CJ starts with a yorker which nutmegs Afridi. Dot ball. "Chris Jordan? Really? This has got to be for no other reason than wanting to test him under pressure." "For England I'd definitely go with Woakes but for Pakistan it's a bit tougher to pick their bowler." "There are two batters I'd definitely be picking - this is a Buttler versus Boom Boom bash-off." A huge roar greets Pakistan's Shahid Afridi and Umar Akmal to the crease. No Shoaib Malik? Bryony Lever: #bbccricket Right down to the last ball. I'd rather have cricket than a soap any day. "I like the Super Over. I realise it's kind of an Americanism really but it's almost like penalties in an FA Cup final." England will surely go for Chris Woakes with the ball? Then Jos Buttler and Eoin Morgan with the bat? Basically, it's a one-over match. Each team nominates three batsmen (so lose two wickets and you're all out), and one bowler. Right then, we're heading for a six-ball shootout. England's first ever in this format. Pakistan scamper a single. We need a Super Over to separate the teams. Superb drama. Scenes, as they say. "Woakes has been excellent in the last two games that have gone right down to the wire, he's been able to handle the pressure." "A wicket! Can you believe it?! Malik is gone! Oh the drama, it's fantastic." Sensational drama. Shoaib Malik hammers a catch down the throat of long-on and that leaves Anwar Ali to try and score the two needed to win the game. "Chris Woakes is still holding his nerve here. He's bowled another fantastic ball right into the blockhole." A scampered single puts Shoaib Malik on strike. Two from two. I hope Scampi (see tweet below) is enjoying it? Hang on. That's a dot ball. Pakistan need three from three. "What a blow from Tanvir, he didn't want to miss out. He's launched that." Chris Woakes is England's go-to man in this situation - of course he saw them over the line the other night. Just. He sprints in to deliver to Sohail Tanvir and the left-hander clobbers a maximum over long-on. Pakistan have got to win now? Surely? "After every ball we are likely to hear the music because there will be an England committee meeting going on." No pressure Chris Woakes. In the block hole first up and Shoaib Malik hits a single to mid-on. Another single means Pakistan need 10 from the final over. If they get 9, we'll be in for a Super Over. "The ball was pretty much a wide and Malik threw the kitchen sink at it. Sometimes the luck just goes for you - maybe not his finest shot but he'll take it." The penultimate ball of the over is scooped over the vacant slip region for four by a stumbling Shoaib Malik who gets out the Go-Go-Gadget arms for that one. Dot ball. Chris Jordan's yorker does the trick. For now. "It doesn't help England with Pakistan having the right-left combination, especially with Jordan struggling to find his groove." A straight single from Sohail Tanvir, whose shot evades the diving Chris Jordan at the non-striker's end. The expectant crowd claps the bowler to the wicket and Shoaib Malik smears a full toss to the boundary rider for another single. "Jordan has not been with it but for the England coaches seeing how these boys do under pressure is worthwhile." Let's go ball by ball. Tanvir helps himself to a single to put Shoaib Malik back on strike. "This is terrific from Malik. He's played those two shots so well and he's going to after being out there for so long." Shoaib Malik is keeping calm here, advancing down the pitch and bisecting three fielders with a delicate cut down to backward square for four. He swivels on the next delivery and belts another boundary. Great batting. "Willey has made the breakthrough. England needed that although Malik is still there. When a character like Afridi is out does that send a tremor through the Pakistan line-up?" Arthur Goddard: Sick of people slating Jordan. He's extremely consistent. You know what you get from him. He goes at 10 an over every over. Mmmm... have we written off England too early? Shahid Afridi shuffles across his stumps too far and is bowled round his legs by David Willey, who picks up his third wicket of the game. "With 29 needed from 18 balls I think it's very much now swayed in Pakistan's favour." "That was very sharp from Vince, he pulled it back in one motion otherwise it would've been four." James Vince saves two with a superb stop on the boundary, but Shoaib Malik still gets the two runs he needs to score a career best in this format for his country. Chris Jordan follows it up with a good yorker which is dug out for a single. "Jordan has not really hit his mark here - the first one down the leg side, the others with a bit of width." This is turning into a cracking game - it's got everything you'd want in a finish. Shoaib Malik looks imperious for Pakistan, getting down low and crunching four through point. Carl Carritt: Alastair Cook's opening partner being ditched after a handful of Tests. PitchedOutsideLeg: However good their position appears to be, England will never make winning look easy. England turn to Chris Jordan with four overs to go. "It's a mighty six - another one onto the roof there on the leg side. The fans are cheering on Pakistan to victory and they're going to get there with shots like that." Shahid Afridi is batting like he's on the driving range. He gets one in the slot from David Willey and crunches it out of the ground. They should award him eight for that. Mark Savile: RE: Lee Meloy - we've got him, he's called Ben Stokes! Shahid Afridi is almost run out - a direct hit and he was a goner. Good fielding at mid-off by Eoin Morgan. "It's all set up for a great finish - you sense it could be one of those tasty games." Chris Mitchell: Only one team in this. Really poor from England but great acceleration from Pakistan. "Malik has played a brilliant innings. He was around when his team lost a few wickets but he settled things down and now he's started to explode with a few boundaries." Shoaib Malik continues to plunder runs against England, scoring his fourth T20 international half-century to put Pakistan in a great position. His best in this format for his country is 57. "Pakistan haven't run very well but these two have communicated straight away. This partnership is a little bit tasty so far." With a delicate dab to the third man boundary by Shoaib Malik, I make Pakistan favourites. The momentum has shifted dramatically. "I think most of us would also have turned to Chris Woakes here to get some control of the situation." Pakistan are getting all the luck now: a Chris Woakes off-cutter bamboozling Shoaib Malik, taking the inside edge and running away for four. Lee Meloy: If only we could put Plunkett's pace & bounce, Woakes' control & batting and Jordan's fielding into one player. "Malik is a good player of spin bowling, he got to the pitch, made it a full toss and it was a magnificent strike." Shoaib Malik looks just as dangerous as Boom Boom, the right-hander clattering Moeen for a straight six. "That's enormous from Afridi, he's swept it onto the roof in the far corner." Nasa might have picked that up on their radar! Shahid Afridi gets down on one knee and clouts Moeen Ali into the leg side. It went miles. Game on. Once again, television cameras pick up on a domestic cat prowling the boundary. Does it live at the stadium? It should watch out now as Pakistan put their foot to the gas. This time Shoaib Malik drives four back past Adil Rashid. "Afridi's innings could all be over in this over. His exit could be swift." "If only Afridi could come up with four or five more of those then Pakistan could do this." Adil Rashid is showing off now. He bowls a ripping leg-spinner which Shane Warne would have enjoyed. His next ball, however, is a full toss and Boom Boom does the rest with a meaty six over long-on. "Afridi is sometimes a bit of a let down. He's advancing in years but he's got all the ability and if he just allowed himself to think about it he could be a match-winner." Ramiz Raja: "I still think he's a bowler who's tried to become a batsman." It's going to be some innings from Shahid Afridi if he's going to rescue his side from this situation. His first scoring shot is typically aerial and uncontrolled but it lands safely into the off side for a single. "Brilliantly caught by Chris Jordan, a wonderful catch - he's got a magnificent set of hands." Chris Jordan is outrageously good in the field. This was a dolly by his standards, but they are pretty high standards. Patrolling the boundary like a gazelle, he plucks a catch out of the night sky just before it sails over the boundary rope. It's Boom Boom or bust for Pakistan now. "With the rate at 10 an over on this wicket, it won't be easy. These two need to do it or there needs to be a bit of Boom Boom Afridi." Adam Wheeler: Jimmy Anderson swinging it around corners at Trent Bridge. If England win today, they will not only earn their first ever series whitewash but also ensure they go through the calendar year unbeaten in the shortest format. If they do that next year, they'll be world champions. "That was beautifully struck - the two players who have played Rashid well have been Hafeez and Malik." Shoaib Malik gives the Pakistan fans something to cheer about when he hits Adil Rashid back over his head. A risky shot, but one which pays off this time. James Levy: No conversation about cricketing certainties is complete without Brad Haddin losing a review. Isn't Shane Watson the Australian market leader in this category? If Moeen can get one to straighten, he's in the game here. For now, the batsmen know they can shuffle across and tip singles into the leg side. Another tidy set of six and Pakistan are being hurried out of this game. Mike Bell: I sit and watch for ages, nothing happens. I go to loo, at least one wicket falls. Always has done. "It's always agonising for a fielding side when these reviews go on and slow motion never helps. I would have given that out as an on-field umpire but who wants to be a third umpire?" "I think the umpires have reached the correct decision there." Vic Marks agrees: "I think so too but you never know the longer these things go on." Any bowler worth his salt is a superb fielder off his own bowling, and that applies to Adil Rashid. The Yorkie leggie takes a fine return catch low to his left to send Mohammad Rizwan packing. It takes an eternity before the third umpire gives it out, because of a number of slow-mo replays which hint at the ball touching the ground. But that's a proper catch and thankfully the umpires get it right. In this instance, I think technology did nothing other than cloud the judgement. Hafeez is the undisputed king of comical run outs but Stokes junior is king of the stage. Solid 'tache too. Moeen Ali is also into the attack and he too is getting plenty of spin. It's keeping the batsmen in check for now, with Rizwan and Malik limited to ones and twos. The required run-rate is up to 8.71. James Hiscock: "Bad light" stops play at 5pm in a Test whist all the fielders wear sunglasses, due to cricket's arcane and unfathomable rules. Carl Carritt: Ian Bell dropping a dolly in the slips. Time for some Adil Rashid leg-breaks. He's instantly milked for ones and twos, with Mohammad Rizwan continuing to play a strange shot which is a hybrid of a pull and a sweep. A peep, perhaps? There is turn for Rashid, by the way, with one delivery pitching on middle and almost being taken at first slip by the keeper. Adam Davies: England bowling twice in a day in any Test series we play. The Badger: West Indies losing a dead rubber Test. "That was not a good over by any stretch of the imagination from Chris Jordan I'm afraid." Chris Jordan is dripping in gold and sweat, and he can hardly believe it when Mohammad Rizwan edges four through slips and then helps himself to a boundary off his hips.To be fair, it's fairly innocuous bowling. To underline the point, a horrible over-pitched delivery is tucked round the corner for four more. CJ is livid. As should be his captain. "Chris Woakes came in and cleared the boundary from the off and has got the white ball skills. He stands out from the likes of Plunkett and Jordan who can be much of a muchness. He's crept above those cluster of players." Pakistan have gone quiet as they attempt to rebuild from that disastrous start. Chris Woakes, who has been England's most economical seamer in this series, is good at keeping a lid on things. Just five from the over. Robert Young: What about an Atherton snick to first slip off McGrath? James Mutton: Surely an English batting collapse? "Pakistan need the Australian Mel Jones to sort out their running. She came over for us and would determine how many runs you'd lost through poor running in the previous game. She would then make us run those runs before training sessions." Charles Dagnall replies: "In my team the punishment was you were dropped." Joe Root looks like a great bloke to be around. He's stood at slip mimicking Chris Jordan's laid-back run-up to the bowling crease. Ever the joker. There's not much to cheer about in this over though, with Shoab Malik crunching a sumptuous cover drive. What are cricket's great certainties? We've had Shane Watson getting out lbw and a Pakistan run-out. Any more for any more? Let us know... and be quick. Pakistan don't look like they'll be hanging around tonight. For better or for worse. Mohammad Rizwan starts his innings with a crunching cover drive to the boundary. Why not? "If you get off to a bad start in any form of cricket then you put yourself on the defensive and 150 now looks an eternity away for Pakistan." "He completely got his body in the wrong position, he was pretty much stood bang in front of his stumps and if you get hit there you're done for." "Had a nice day at work, love?" "Not really, I run out our gun batsman and then got a golden duck." Rafatullah has had a 'mare. He misses a straight one and the ball thunders into his pads. Plumb. Rob: #bbccricket another Pakistan run out going to the third umpire... To see which batsmen is out. Comical. There's an inquest going on inside the Pakistan dressing room. Rafatullah is best advised to strike a match-winning 70 if he wants to avoid a few harsh words later on. The coaches, including Mushtaq Ahmed who is always smiling, look furious. As does the skipper. Mohammed Hafeez, by the way, has been involved in four of seven Pakistan run-outs on this tour. One from Chris Woakes' opening set of six. "Rafatullah just wasn't even at the party - he just went without looking at his partner and he's been given a life there. They were both at fault there." "It's horrific, harakiri-style running yet again from Pakistan." "At times you get a slight mistake but with these run-outs there is just no communication between the Pakistan batsmen. One of them always just goes gung-ho." Not again! Mohammed Hafeez, who seems to be the king of comical run outs, is sold a dummy by his batting partner and is run out by Eoin Morgan with no batsman stood at the non-striker's end. There's a long delay while it's decided who should walk. It must have felt even longer for the two batsman who stood awkwardly side by side, refusing to talk to each other... rather like two boys stood outside the headmaster's office after a playground scuffle. "I do love that Willey's so passionate. That hunger makes him step up as a cricketer - he always looks to be in the action." "There was a little bit of purpose in Willey's celebration towards Shehzad. Willey normally always looks like he's just lost a fiver but it doesn't take much to get him fired up." It's shots like those which make you grateful for James Vince's knock. Ahmed Shehzad charges down the wicket at David Willey and has to keep walking as he misses a straight one and is bowled. Willey celebrates Incredible Hulk-style, then momentarily tones it down when the batsman walks past. Very excitable. I'll be interested to see if David Willey can add some extra pace when he moves to Yorkshire under the guidance of Jason Gillespie. If he can find an extra 5mph, he could become a Test match player. The raw ability is there. David Willey gets nice shape with his opening delivery, but it's too leggy and Ahmed Shehzad clips four. David Willey is stood at the end of his mark. Time to see if Pakistan can avoid a series whitewash. It all means James Vince ends his debut series with 125 runs at an average of 41.66 and a strike-rate of 119. He's have taken that when he boarded the plane to the UAE. Vic Marks, as ever, hits the nail on the head. It's tempting to question what James Vince was doing - I did - but he played a fine anchoring role and that allowed one of England's lower order fireworks to sparkle. In this case it was Chris Woakes. "It is very strange Afridi didn't bowl Malik more - we all know what he can do skidding the ball on but he's also very economical, it's not just his wicket-taking ability." "If it's a belting track and your opening batsman is still there in the 19th over and not on 50 yet you think, 'what is he up to?' That doesn't apply here, there were wickets falling and Vince knew there was firepower to come." "I think Vince and Woakes have got England up to a par score. It's not so easy to bat here in Sharjah and I think we could have another final over thriller." England set Pakistan 155 to win then? Who do you fancy? England have somehow managed to give themselves something to bowl at. It's big... it's either six or out... it's out. James Vince's plucky, if unspectacular, knock ends when he is caught on the square leg boundary. James Vince tickles four. He's one blow short of a half-century now. "If it goes to the right fielders, Pakistan look like a good fielding side and it went to Umar Akmal that time. He did a little jig after catching that - and why not?" If England do win this game, Chris Woakes might be the man responsible. He has dragged England to a respectable score with his highest T20 international score. He finally holes out to long-on... but he's replaced by another blaster in David Willey. "That's another six for England - this is going to be a target that I think will make for a nice nip-and-tuck game." "We'll come to an ultimate conclusion after we see who wins the game but I think England will be grateful for Vince staying around while others fell. Though he has lost his timing in recent overs and Woakes is showing that up." It's as though Chris Woakes is playing with a shovel. He's underneath everything and chips the ball into another gap for a well-run two. A single brings up the 50 partnership, of which James Vince has scored eight. The Hampshire man puts the hammer down now though, swiveling and dragging four backward of square. He ends the over with a meaty six over square leg. England on the charge. "This is a different story to Vince at the other end - Woakes is in terrific form and making a real difference here." "It doesn't matter how the innings goes, England seem to get to between 160 and 170 every time and could do it again here." Pakistan are keen to bowl lots of slow cutters on this wicket, which is grubby in appearance. They too are likely to have to graft for every run. Unless you're Chris Woakes of course, who reaches for a wide yorker and creams it over extra cover for another six. Jos Buttler-style in terms of its execution. "I think this is a good innings from Vince but it's an odd one. To open the batting but to enter the 18th over with 30 runs is a bit strange. But he's not faced much of the strike." "I bet you Anwar Ali is thinking, 'I wish I'd caught that one down at third man.' Because that was Woakes and he's hit that a long, long way. Our team of statisticians suggest that went 98m."